Influential Software has launched our S/4HANA Cloud website to promote our expanding SAP S4/HANA Cloud ERP services, bringing intelligent Cloud ERP BI to small and growing UK businesses. Need SAP S/4HANA Cloud Services? Ever expanding its services to beat the cutting edge, Influential Software is proud to announce a dedicated site for S/4HANA Cloud ERP services and solutions. 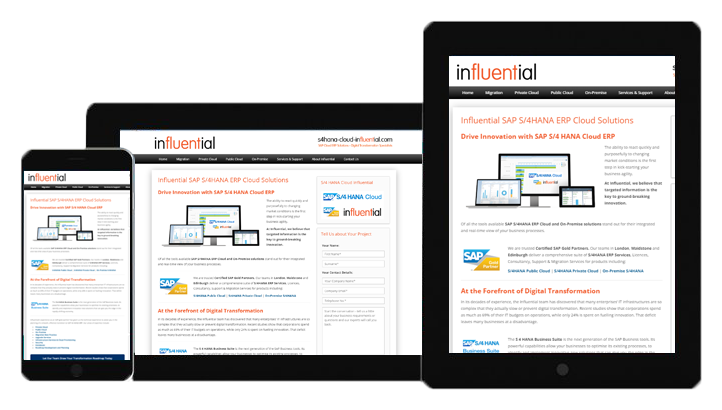 The newly launched www.s4hana-cloud-influential.com showcases our expertise in this rapidly developing area, from migration to the cloud and on-premise solutions. Since SAP announced that it would discontinue support for SAP© ECC in 2025, the window for cloud-migration is growing narrower by the year. Many of our clients are waking up to the necessity of moving now rather than later. Our advice is, don’t leave it too late! If these benefits seem like a manifesto for digital transformation, then that is no coincidence. SAP S4/HANA Cloud ERP is the face of the future in a world where IT is central to business success. For Influential Software, digital transformation is more than a buzzword. Today’s customers demand services that are fast, personalised, and always available. The essence of digital transformation is finding the right IT infrastructure to meet that demand. SAP’s roadmap for 2025 and beyond is designed to simplify your infrastructure. They do this by focusing on one digital core, their SAP HANA in-memory database. A second big change is SAP’s decision to go open-source with Linux. Our SAP team specialises in designing secure, high-performance, and highly available Linux data centres. “That is the migration,” as Shakespeare may have written. In fact, there are many more than two options. From S4/HANA Private Cloud and SAP S/4HANA Public Cloud SaaS to On-Premise S/4HANA ERP and sub-categories within these, S/4HANA can adapt to a range of configurations to suit your business. Among these options, it can be a challenge for businesses to balance the factors of cost, connectivity, agility, and governance. Thankfully, SAP-certified S4 HANA Consultancy services are on hand to assess your requirements and define the best solution for you. If you would like to know more about our S/4HANA Cloud, please visit the S/4HANA Cloud website to find out more. Or if you are ready to speak directly with our SAP Gold Partner specialists about S/4HANA Cloud, Digital Transformation or Business Intelligence, click the button below – and let’s get your business moving to the cloud!